The vaccine for the Human Papilloma Virus (HPV) is the first vaccine created that can prevent cancer—specifically cervical, penile, neck and throat cancers. Even with this amazing advancement in public health and preventive medicine, less than 50 percent of women and 2 percent of men in the United States have received the HPV vaccine. This low rate of vaccination is impacted by misinformation about the vaccine, misconceptions about HPV and concerns about vaccinating adolescents against a sexually transmitted infection (STI). There are presumably many questions swirling around HPV vaccination and hopefully the information provided here can answer questions and stimulate discussion. HPV is the most common STI among U.S. adolescents—75 percent of people will become infected in their lifetime, with the peak of prevalence at 15 to 25 years of age. There are different types of HPV. Some of these are cancer-causing while others cause genital warts. HPV lives in our cells and many times our body clears the virus, but sometimes it persists and this can lead to the development of cancer-causing lesions. If you are exposed, the beauty of the HPV vaccine is that it is 95-100 percent effective at preventing infection and the resulting lesions. But why is the HPV vaccine recommended for 11- to 12-year-old boys and girls if they aren’t engaging in behaviors that put them at risk for STIs? The HPV vaccine is more effective when given before a person becomes sexually active. The idea is to ensure that all youths are protected before they need it—therefore it is recommended at age 11-12, but can be given through age 26. In spite of concerns the HPV vaccine would lead to more sexually promiscuous behaviors, there have been multiple studies that show HPV vaccination status does not lead to increased sexual behaviors. But wait. Boys are supposed to get vaccinated, too? There are several important reasons that everyone should get the HPV vaccine. First and foremost, HPV does not just cause cervical cancer in women; it is responsible for 40 percent of penile cancers and 25-35 percent of oral throat cancers. In addition, genital warts can happen to anyone. And lastly, if you are protected from acquiring HPV, you can’t spread it to others. OK, maybe it is starting to sound like a good idea to protect our children and young adults from HPV, but is the vaccine safe? The HPV vaccine is given in three doses spread out over six months and it is very well tolerated. But what about the cost? St. Luke’s Clinic-Family Medicine is designated a Vaccines for Children clinic, which ensures Idaho children under age 18 receive vaccinations at little to no cost. Call the clinic at 788-3434 to schedule an appointment for the vaccination or to talk with your health care provider if you have more questions. Idaho native Sage Coe Smith is a medical student at the University of Washington. 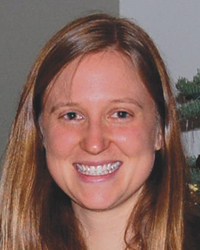 She is working with St. Luke’s family medicine physicians during a five-month rural clinical rotation. Dr. Lyons and Dr. Woods provided support for this column.